The obligatory “what the hell was I doing all summer” post. Now that I’ve sent off my final paper and travel reimbursement, I am starting to feel like my summer is kind of over and I can reflect and report on what happened. 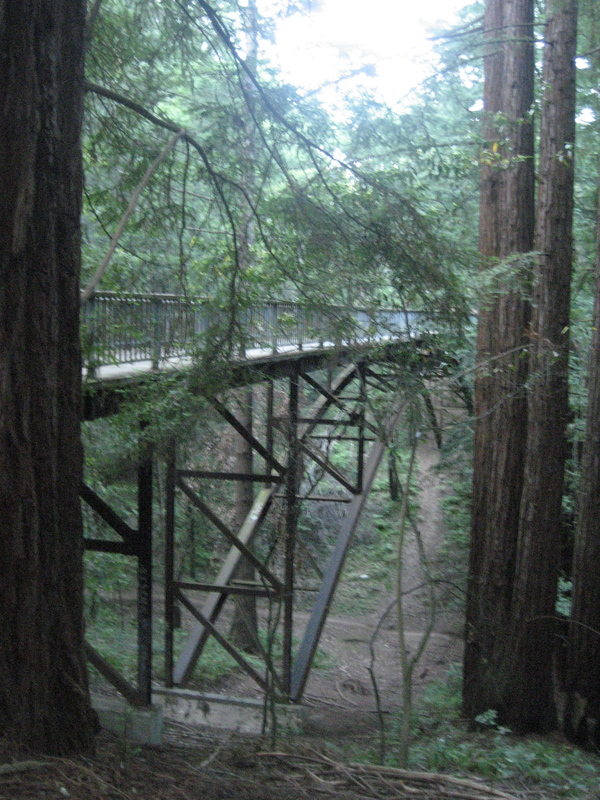 I was in Santa Cruz working at UCSC as part of the SURF-IT program, an NSF-funded research internship for undergrads in Computer Science and Engineering. I was lucky to meet and hang out with 16 other fabulous SURF-ITs in the forest, overlooking the bay, that was our campus. UCSC is also super cool because the mascot is a BANANA SLUG. Yeah, unbeatable. Sri Kurniawan was my advisor — she’s probably one of the most upbeat and energetic people I’ve ever met. I learned a lot about her overzealous vegetable garden and fruit trees, strange neighbors, and that she’s very chill about inviting people over and making experimental food, 99% from her garden. My grad student advisor, Sonia Arteaga was the most involved with my work (I was working on a pilot study for what she plans to do as her PhD project, essentially) and was nice enough to give us rides around to places like Sri’s house, Thai food for lunch, or Watsonville/Salinas where we did a lot of our user studies. The other undergrad on SURF-IT I worked with was Adrienne Woodworth from St. Lawrence University in New York. She is the kind of person who has a story about every possible topic of conversation (usually quite amusing). It was also convenient that she is as much (if not more) of a night owl than me… we would often be working in our rooms on our project at 3am and be emailing/IMing each other about it then. 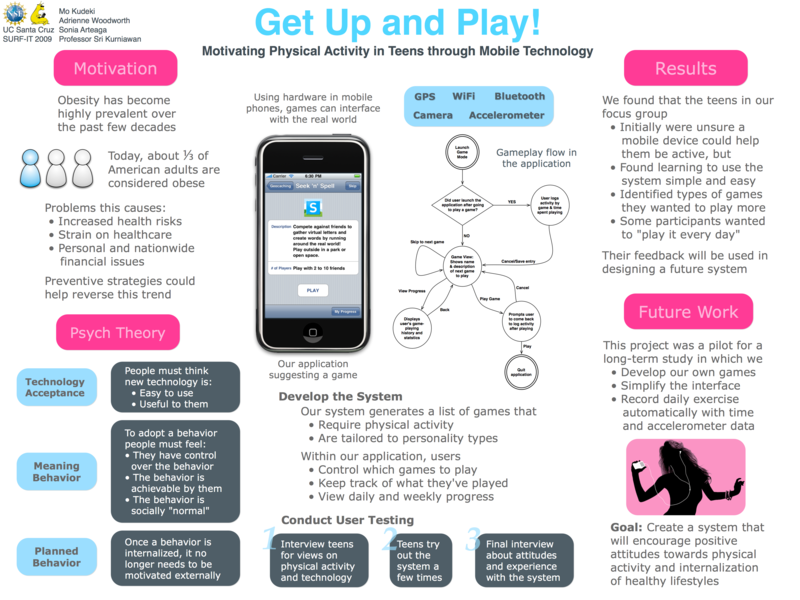 The project we did was to make a prototype mobile application that used interactive games to motivate teenagers to be more physically active. Sort of think a Wii on an iPhone. These are games that involve physical activity in some way (walking around in the real world to try to get somewhere on a map, or fighting games where you swing the phone like a sword, etc.) We made an iPhone/iPod Touch app that recommended a list of games and logged your playing time. My part was mostly to make the game mode structure, that would recommend, display, and let you play games. Adrienne made a personality test for the beginning of the app, since it was supposed to cater to different personalities, and she made some characters (agents) who would say motivational phrases like “You’re doing great!” and Sonia made the database for keeping track of play times and user profiles. We then found real live actual teenagers (whoa!) to test the app and tell us what they liked and what they didn’t like. Our mileage varied with different parts of the app, and we have a better idea of what to do in a “real” version of such an app to improve it. Probably the most fun thing about the user testing was that we met the same group of 6 kids or so multiple times over the course of a month, so we got to know them fairly well. They were really interesting to talk to and interview/observe/study and it actually impressed me how not-flakey they were about showing up at random Friday afternoons in the summer (though I guess they had to be serious about it to receive their Forever 21 gift certificates). I think all these different things kept my summer pretty interesting — I wasn’t only coding all day. Although I was indeed writing iPhone apps, I was also working on grants, transcribing interviews, driving out of town to meet teenagers, playing iPhone games, learning about Sri’s overly productive garden… (plums, tomatoes, lemons, oranges, zucchini, etc etc. that desperately needed to be eaten by someone). Since all of my work was iPhone coding or something else completely laptop-based, I often worked outside, downtown, on the bus, etc etc. which I mostly took advantage of by hanging out at Pergolesi and Asana Cafes. During the middle of our project, we wrote a paper and were published in the June 2009 SIGACCESS newsletter! By the time I turned in my final paper for SURF-IT of course we had finished the project. It’s over here at my page on the SURF-IT website.